I had seen this at the counter for ever, and never bothered to pick it up and try it. Until one day, one of the employees was spraying it on himself, and I curiously asked is it any good? He was like ohh you just have to try it, and so I did. While i was in the store i had it on and it felt so refreshing. My skin felt supple. So of course I had to go back to the counter to get it. There is a scen...read moret to it, like roses, but its very faint and within a minute the scent fades away. I use it if I feel my skin needs a little pick me up during the day. I bought this at Ulta after reading so many positive reviews online. It was cheap and comes with a good amount of product. I normally spray it on after I shower and before I put on face lotion. 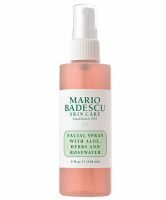 It smells great and leaves my skin moisturized, like a little spa treatment each day. I would recommend it!